The Postpartum party is an ebook specializing in postpartum care and recovery. It covers all bases, INCLUDING how to properly care for a 4th degree tear. THE BOOK IS LIVE, AGAIN! The Best 9 Month Old Baby Food Combinations! + FREE grocery list checklist! We've officially hit the "I-don't-want-baby-food-I-want-whatever-you-have-mom" stage, and it hit us HARD and OUT OF NOWHERE! One day she was obsessed with her baby food, and puffs.. and now she won't even look at them. I know.. crazy! So I was off to the grocery store almost immediately. I ventured down the aisles on the hunt for the best (and safest) foods to give my 9 month old! 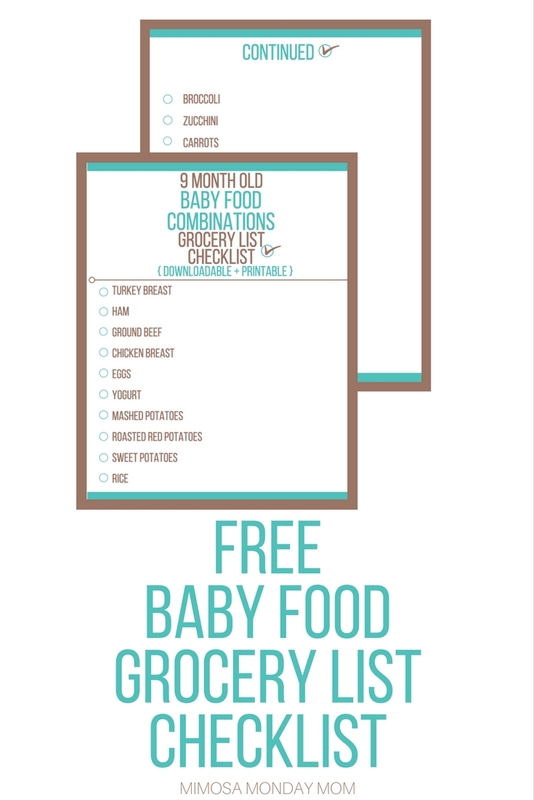 FILL OUT THE FORM BELOW TO GET THE FREE 9 MONTH OLD BABY FOOD GROCERY LIST CHECKLIST! I respect your privacy and will never spam you, or share your email address! If you don't you will NOT receive your free checklist!! *She isn't extremely interested in breakfast just yet, so she only eats about 1/4 of the egg as of now. I don't push it, because breastmilk is still her primary source of nutrition.. so if she doesn't finish, I just nurse her a little more. *She will eat the entire cup of mandarin oranges. She is OBSESSED with them. I'm always careful with the Turkey breast, to make sure it is cut up properly. She likes feeding herself with her own hands, but will also allow me to jump in and help her out when she needs it! *Usually, she just eats what we eat. This is just an example, but for the most part, I take whatever we have and cut it into small pieces. Chicken, steak, pork, veggies, potatoes, beans, rice, etc. Small portions at a time, and very easy-to-swallow pieces! We are still keeping baby food pouches, and cereal snacks on hand, just in case she has some weird regression (babies, am I right?). But for now this is what's working for us! I'm loving not stocking up on baby food as often! As a side note, we have also started using the Munchkin Latch Transition Cup to introduce water into her diet. She's taken to this cup greatly so far, and I'm pumped to buy more! There you have it, friends! Make sure to download my FREE grocery list checklist to ensure you don't miss a thing at the grocery store! Share with your mom friends who may need some guidance! The ULTIMATE Christmas Gift Guide of 2017 - Ideas for the Whole Family! The holiday season is upon us, friends! Time to really ROCK this Christmas with the perfect gifts for everybody! I always tell myself (and my family) we are having a low-key Christmas (I really do try) and then I end up going all out! Finding the perfect gift doesn't have to be hard… sometimes we all just need a little bit of motivation! Check these deals out below… and trust me, there's a gift in here for everybody! As a bonus, you can sign up for a 30 day FREE trial, and receive FREE 2 day shipping on all Prime eligible orders! You could even cancel after the holidays, if you wanted to! Apple watches. Of any sort, really! DIY Scrapbook Album <—— SEE MY POST FOR THE PERFECT CRAFT LOVERS GIFT, HERE!! I hope you found some great deals today! Bear with me here, as I am NOT a blogger who typically blogs, about.. blogging (that whole statement just confuses me, but I'm sure you know what I mean). Therefore, I'm going to keep this short and sweet! I just wanted to get it all out here, for some people struggling with amazon, and particularly their affiliate program. As most of you know, Amazon is quite particular with their affiliate program, and does have A LOT of rules! I was unaware of this for awhile, and once I was progressively figuring things out, I started to FREAK OUT that I was going to get banned, shutdown, etc. SO... anxious ol' me reached out to their support team. I had a nice chat with an associate named James, who was very helpful. In the past, there has been a specific set of standards about the affiliate program going around, that you could not use their links on Pinterest. Meaning that, if you wanted to pin something from your affiliate link that lead from Pinterest directly to that Amazon product (where you could make a commission if said item is purchased), you could potentially get in trouble. Well, I have WONDERFUL and RECENT news…. YOU CAN INDEED, LINK DIRECTLY FROM PINTEREST, TO THE AMAZON PRODUCT YOU ARE PROMOTING WITH YOUR AFFILIATE LINK! Don't mind my response question - if you're wondering, that answer is no LOL, but disregard that! PS - their customer service chat function is AWESOME and QUICK! I couldn't be happier with how easy it was to get answers to questions (that I thought I would have to research for days) in just minutes! Really, I just plan to share this post with a few blogger friends in various Facebook masterminds I'm in, as well as a couple of group boards I'm in relating to blogging. PLEASE feel free to SHARE this info with any blogger you think that could benefit! Hope your blogging journey is treating you well! Large Breed Dog Bed Hack - Making the best dog bed, even better! As most of you know, our family has a Doberman Pinscher named Ruxin. He was my first baby, and I'm basically obsessed with him. Being 110 pounds, he is the world's best cuddler! BUT the stipulation with that, is that he MUST be in the bed, between your legs, under the covers. I know.. needy! Nevertheless, he is still my little angel. But the other person that I share a bed with was NOT happy about this way of sleeping. So, I thought… "there has to be a way to crack this dog!" The thing about his dog bed, is that he actually loves it. SO NATURALLY, he ruined it the first 5 minutes it was in our home. Since then, I've bought countless expensive beds and he only wants the best dog bed that we've been able to find. BUT HE STILL WON'T SLEEP IN IT AT NIGHT. We finally have an infant with wonderful sleep patterns, and what happens? Ruxin keeps me up all night - go figure! SO I IMPLEMENTED ONE SUPER EASY CHANGE, AND MADE THE BEST DOG BED, EVEN BETTER! I can't believe I hadn't thought of this before… face palm! I've put flat sheets, queen sheets, twin sheets, etc. on his bed before because I KNOW he loves sleeping one top of a sheet (hence why he's ALWAYS in our bed). But they would always fall off before he could even get comfortable! The bottom line was, there were no sheets that had the right snug fit for him, to move around in bed, and remain comfortable on top of his sheet. He's a happy little guy, and so is my other half! Although I can't promise this will keep him out of my bed forever (maybe because I am obsessed with him and cuddling) BUT he actually enjoys sleeping in his bed now, too! Momma made the best dog bed, even better! Does your dog have trouble sleeping in their own bed? What have you tried, if anything, to fix it? Anxious Moms & Why We Can't Watch the News. What has happened in Vegas this past weekend is so so extremely heartbreaking. I wish I wasn't using that sentence so often in today's world, but it seems every other week something else is "so extremely heartbreaking". I am an anxious mom. There's no getting around it, and trust me, I have tried. Although I cannot even express how sad I am for those innocent lives that were taken, and for all of their families affected, I can express this : I hate the news. I hate it. And not because of political aspects, or this news source is fake, and this news source is reliable. None of that. I hate all of them. Here's the question I constantly ask myself. Was the world always this corrupt? I'm unsure. I think due to there being a platform to broadcast on, we see these things happening more often than not. This absolutely does not change how sick, terrible, and awful all of these occurrences were, and are. But here's where I become a terribly "uninformed" person. I can't watch the news. I've said it before, and I'll say it again - I can't carry the weight of the world on my shoulders. And it's okay if you can't, either. Every time I walk into my parents, or my in-laws, or my friends houses - the news is always on. I almost always beg to watch something different. I cannot sit in front of a television screen, and just listen to how undoubtably terrible our world is…. on repeat. Because that's what the news does - rolls things over and over and over again. Don't get me wrong, it's not all bad. Some of it is beautiful! But for me, the good does not outweigh the bad, and I just can't handle it. I don't know how people can sit, and watch the same news story of 400 people injured, and 50+ dead, over and over and over again. What does it do for you? I understand being informed, and knowing what's out there is important, but we are in the age of social media and news notifications and news apps, etc. Take advantage of that people! Nobody gets out alive. All of us are going to die, when it is our time to die. And as scary of a thought that is, it is ultimately the truth. Don't sit on your couch and dwell on the insanity around the world. Instead, LIVE. Get out of your house. Take a walk. LAUGH. Do something kind for somebody else. The world continues to spin, and it is our job to ensure that it spins in the right direction. Meaning that, what you put into the world, is what you get out of it. Put good in. Choose to be loving and caring. And then, pray. Pray for the people involved, the corrupt world we live in, and all things involved. Pray that some how, some way, we find a solution and finally learn to live in peace and harmony. Hand your problems over, and ease your anxieties. So, leave the TV. Let's face it, you're going to see it all over Facebook anyways. Get out there, and show the world that for as much hate and disgust, that there is far more love. Punny titles are my favorite, but let's drop the jokes now, because this is serious. What's happening in Texas, Houston especially, is devastating. There is no other description for it; Except - horrible, awful, disgusting, sad, and lastly, beautiful. One of my friends reached out to me yesterday in hopes that I would help her get some things together to send to Houston and at first I was iffy. I am the worst kind of person sometimes, in the sense that I ignore what's going on mainstream. I have a huge belief that social media has shaped our communities, our country, our world, into just a giant mess. I understand what's going on in Houston has nothing to do with social media. Where I'm going with this all is, I don't watch the news. Point blank period, ever. Not because I don't believe what they are broadcasting is untrue, (although you can never be too sure) but because I don't want to spend my life curled up in the fetal position, depressed, because the world is terrifying and disturbing. I understand this is unrealistic, and probably not my greatest trait. I understand I should be aware of my surroundings, and what's going on in the world. If you live, or have ever lived, an anxious lifestyle I'm sure you understand where I'm coming from. My mental capacity just cannot take on the load of the world, and I'm sorry for that. Back to Houston - how does this all relate? I was iffy to give my friend things. Isn't that terrible? There's a state of emergency in another part of our country and I found myself ESPECIALLY avoiding the news and internet because of it. I found myself ignoring what was going on. But then something sparked in me, and slapped me around a little bit. What is wrong with me ???!!!!!!! Why am I just laying in bed, in the comfort of my own un-flooded home, while my baby is an hour into her peaceful nap? I was almost annoyed when Kaitlin texted me asking for stuff, like wow what is my issue!? So I changed my entire thought process from that second on. I jumped up, grabbed my phone, and got to couponing. I have to give credit, where credit is due, to The Krazy Coupon Lady. Her app was a huge help to quickly, and efficiently, get the most for my money. I am frugal as heck, and I don't spend a penny without checking this app first. She is not paying me to say this, and I'm not apart of any affiliate programs for her - I just feel this passionately about her app. So I pulled out my app, and searched for the best deals at Walgreens, Publix, and Target. I was on the hunt specifically for things I did not have to print, and did not have to have newspaper clippings for. Which means I only used the Walgreens app, the Publix digital coupons app, and the Cartwheel by Target app. (Of course I also used my shopkick, and ibotta apps, to maximize savings - you can read more about those here) But the point is that, this was an easy task for people who are not familiar with couponing at all, and anybody can get out and do this, too. Between Capri, and I, we spent a total of $30 and this is what we got. Our original total for all of those things was about $67 after tax. We spent a total of about $30 after tax out of pocket. And I didn't print one coupon. Or clip anything from a newspaper. I just clicked a couple of buttons on some apps. That's it. .... and growing! I keep adding things throughout the day, and I'm sure I'll do another coupon haul before the truck leaves on Friday. The moral of story here people, is DO SOMETHING!! DO NOT BE LIKE ME, AND IGNORE WHAT IS HAPPENING AROUND YOU - EVEN IF IT IS NOT LOCAL TO YOU. Here are some places that you can help if you don't even want to leave your bed. GlobalGiving Foundation - Goal to raise $2 Million, money will go to food, water, shelter, & long-term recovery. GoFundMe - I know you all are familiar with this one, but this particular landing page goes to multiple different campaigns related to and involved with Hurricane Harvey relief. The Salvation Army - This one is important to me, as the significant other of a first responder. They are working on providing water and food to all of the first responders. Austin Pets Alive! - My personal fav! One of my best friends works here (Hi, Em! ), so I know it's an amazing shelter & company, and she's super passionate about it, so that makes me that much more passionate about it as well. They are in need of donations and supplies, as they have taken on hundreds of animals. If you are local to the Treasure Coast of Florida, private message me, or email me, and I will be happy to help you arrange a pick up, or drop off scenario. Nothing like sending a ton of love, positive vibes, prayers, whatever it is you believe in to our friends and families in Texas! This is free! There's no reason you shouldn't already be doing this! These are just a FEW of the ways you can help. There are a million more resources and here is another link to NPR listing a TON of other disaster relief resources as well. If you remember, (I know, there was a lot in this post) at the beginning of this post my last description of what's going on in Texas was 'beautiful'. I think watching our community come together, despite race, religion, ethnicity, financial status, etc. is beautiful. I think watching people all over the world contribute to this cause in any way they can, is amazing. In a time where social media makes it seem like we are all on opposite teams, fighting against each other - choose to see this beauty instead. Choose to see the good in the world, and choose to ignore the hate. In times of trouble, our country unites. Right now, nobody cares what the color of your skin is, or who you voted for. We care about getting our people to safety, and higher ground, and pulling through this. We are the Land of the Free, and the Home of the Brave, and we as a country, have to be the change that we wish to see in the world. I'd like to end this post quoting one of my dear friends, Dana. "Do not forget how EASILY this could be us. We are undoubtedly blessed, and every little bit helps." Mother Nature could have chosen any of our homes. Count your blessing.